Customize your clip art – Change colors, patterns, line thicknesses and fonts. Use the drawing tools to add new objects and text. Objects can be flipped and made opaque or transparent. Resize the picture. Remove excess white space with the Trim Picture tool. 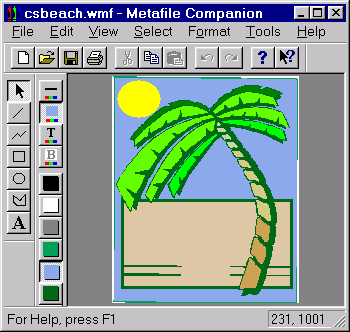 Edit graphs, charts or drawings from other Windows applications – Paste a graphic (in Picture format) from the clipboard or import a WMF or EMF file. Change colors, patterns, line thicknesses and fonts. Add new objects and annotate with text. Create new drawings – Metafile Companion is the quick and easy way to whip up any simple drawing. In minutes you can create just what you need. Looking for a website developer who specializes in WordPress, Responsive Design, and Online Marketing? Graze on over to our sister company, Holy Cow Online Marketing, and schedule your free consultation today. We can't wait to hear from you!